One of the differences between WordPress Pages and Posts is that Posts can have a category assigned to them, whereas pages cannot. Frankly, I think that is just dumbâ€¦ why shouldnâ€™t pages have the ability to have categories assigned. Well, Iâ€™m not the only one that think pages should have categories and there are several plugins that provide the capability. One that Iâ€™ve used for a long time is Map Categories to Pages, and Iâ€™ve used it very successfully on several blogs and client sites. It provides a valuable feature, albeit, deceivingly simple. Once installed there is a category field put on the page editing screen, and a category column added to the page list. In addition, on the settings page there is the ability to include pages in the category page (by default, only posts are shown on the category page), and you can also enable an option to have category posts appear at the bottom of a page. Unfortunately, Iâ€™ve run into some problems with Map Categories to Pages lately, and Iâ€™m not really sure why. I donâ€™t know if it is changes in WordPress or compatibility with other plugins. The biggest problem Iâ€™ve run into is that sometimes I canâ€™t get a page to display if it is assigned to certain categories. Say for example the page is assigned to category Tips and Tricks and it displays fine to a visitor. If I change the category the page is assigned to, e.g. Training or Cool Tools then when the visitor goes to the page they are presented with a blank page. Iâ€™ve tried all kinds of things to figure it out, but so far, no luck. That took the better part of a dayâ€¦ grrrrr! Enter Ninja Pages, Categories, and Tags. This plugin was buried a little bit further in the plugins listing, but installing it is giving me hope that I might have found a better option for showing categories on pages. First, not only does it add the categories field, it also adds a tags field so you can put your pages in a tag cloud. In addition, there are several neat options that Ninja provides that are more than that offered on Map Categories. 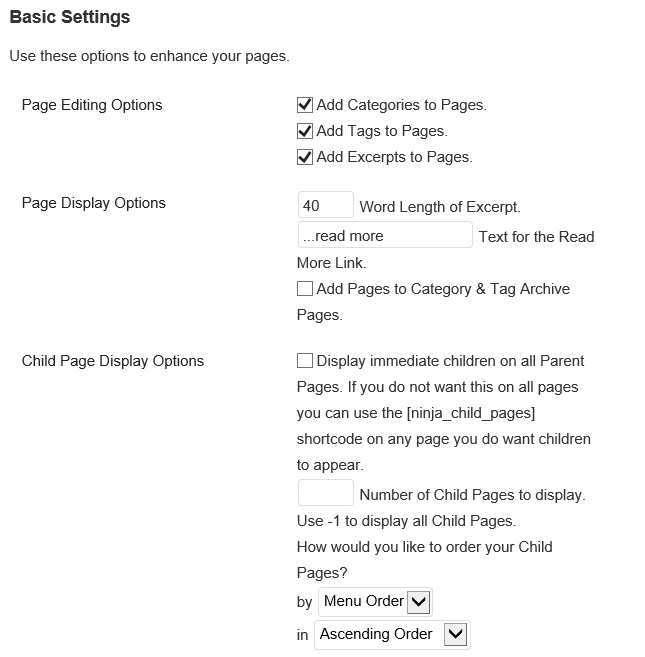 These features include the ability to grab an excerpt from pages and also display page children. 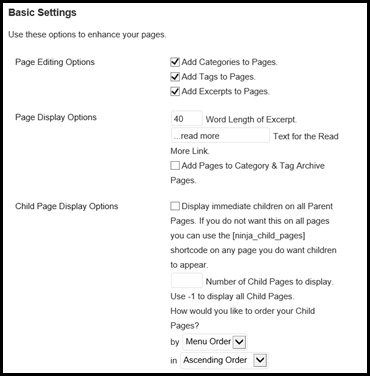 Check out Ninja Pages, Categories, and Tagsâ€¦ you might like it!